Two pairs of stylish reading glasses at a fantastic price! 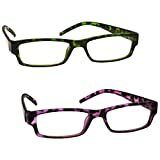 One pair in green tortoiseshell finish and one pair in purple tortoiseshell finish. Two pairs of stylish reading glasses at a fantastic price! Womens/ladies. One pair in green tortoiseshell finish and one pair in purple tortoiseshell finish. For indoors/normal reading conditions. Optical Power +1.50 (diopter).